Just waiting for the fun to begin. Our plane (LAN Airlines) arrived around ½ hour early in Santiago. 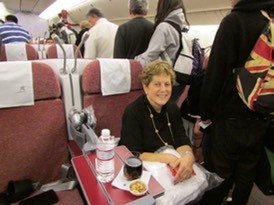 The flight was great - it's been almost 20 years since I flew on a "jumbo" jet (do they even call them that anymore?) This was a 767. 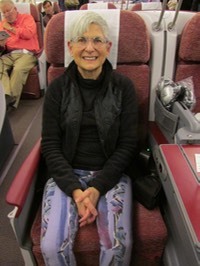 Jane and I had 2 seats next to eachother in the middle of the first/business class section. This meant we didn't have to walk over someone to get to the bathroom. We were served an excellent dinner soon after take off. Spinach salad with poached pears and nuts with balsamic vinaigrette, crab salad (Jane had the squash soup,) shrimp, rice pilaf with wild mushrooms, a cheese plate and choice of dessert - I had the fruit plate. I had a gin and tonic for good measure (very weak, like I like it to be.) I forgot how comfortable those big planes are - feels like you're flying in your living room! The inflight entertainment was great. I watched "The Perks of Being a Wallflower." and started the movie "Hope Springs" with Meryl Streep and Tommy Lee Jones. Maybe I can watch the rest of it on the way home. Both were good. Jane's still down at the check-in desk arguing about getting a room on the club floor - why that was an argument, I can't say. They said they didn't have a record of the request, so Jane dug up the email confirming it. Then they still had to check with some supervisor. Horrible customer service. I felt like telling them, "JUST DO IT!" I'm in a regular room which once was very luxurious but the surfaces are tired and it's not super clean, but not horribly dirty either. There's a bidet - which I have never used, but I'll definitely give it a shot. There will be a tour in another hour and a half, so I'll have some pictures. The city is incredibly smoggy - that yellow, hazy light I remember so well from my LA days. Tons of new construction. Before you get to the built up downtown area, you pass some shanty town areas reminiscent of the road to the Dorado Beach Hotel in Puerto Rico. Once you pass this area, you would not believe you are in a foreign country, let alone a country thousands of miles away. Any urban American would feel right at home in Santiago. The freeways look the same; the cars look the same (maybe a few more Peugots and fewer large trucks and SUVs.) The shops look the same. People dress the same as in any urban city. All the signs are in Spanish and in English. They have a great public transportation system which they are continuing to expand. Would love to spend more time in this city! There are 7 congregations in Santiago, including Chabad... of course. We toured the National Cathedral, and were driven around Santiago including many lovely squares. We went up San Cristóbal Hill where there is a statue of the Virgiin Mary. Unfortunately, the driver kept us at a viewpoint near the top for over ½ hour and then said we didn't have enough time to go to the top. Then he took us to a shop that sold lapis - clearly a tourist trap. We were not pleased. We did get some great shots of a large bird or two - the driver said they were hawks. There is a sub group of birders on the trip and so we surely will find out exactly which species we saw today. I expect they will enrich our experience throughout the tour! I'll post these at my next wifi opportunity. 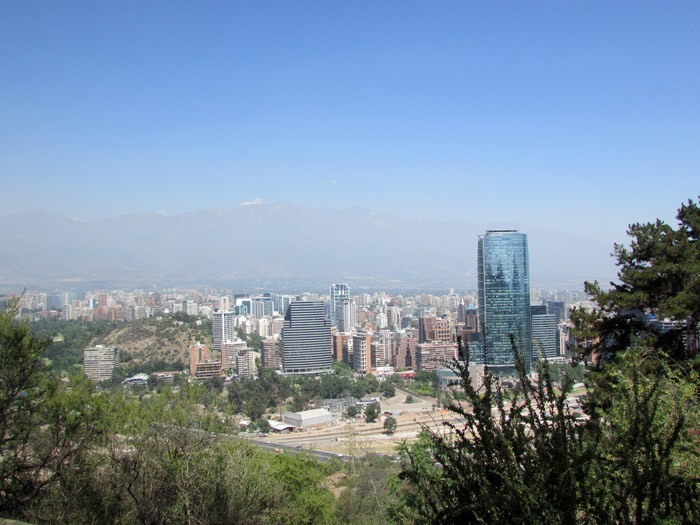 View from San Cristóbal Hill. See all the smog in front of the coast range. The ocean is on the other side of those mountains. Arranged for Skype phone calls so I could call my family using the internet. I have no phone or text service here. Time to get to bed for 4:00 am walk-up call. Yikes. Jane gave me her room key so I can drag her out of bed. Don't know if I'll be in much better shape than she! Met people from West Virginia, Vancouver BC, interior BC, Northern and Southern California, Arizona, Washington, Wisconsin, Australia, Chicago, Hong Kong, Singapore, Texas, Kentucky - a very diverse group geographically, if not socio-economically.